It’s always touching when soldiers return home and surprise their families, but few homecomings have been as creative as the one Pfc. Matthew Windish pulled off Thursday night. The Philadelphia Flyers set up a plan to get Windish home early so he could surprise his family at Thursday’s game vs. the Montreal Canadiens after Windish’s brother, Chris, thought of the idea, according to delawareonline.com. The Flyers had the Windish family gather late in the second period at the Zamboni tunnel, where they were expecting to see a video of Matthew on the Jumbotron. Instead, they were turned around and pointed to a giant box wrapped as a present. 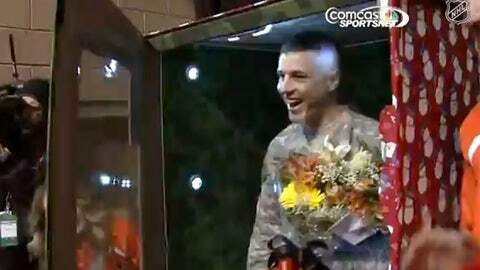 As they unwrapped the gift, they found a life-sized G.I. Joe box — with their own G.I. inside, waiting with a bouquet of flowers to step out and hug his parents. "I was surprised," said Matthew’s mom, Joann Windish. "First, I thought he was coming home, but then I didn’t think he was going to. I just thought it was going to be a video, but when they opened up that box and I saw his face. … We have missed him so much this past year. It was an awesome surprise." Check out the classic reunion in the video below, with a stick tap to Yahoo! Sports.